Realized in collaboration with Johnston Marklee, Room for a Daybed represents a reversal in the typical relationship between architecture and furniture. Conventionally, furniture is selected or developed in response to an existing or new building. With Room for a Daybed we have done the opposite, and developed an interior as a spatial response to the single object it contains: the Twill Weave Daybed. Like the daybed, the interior is built of textile, and it seeks to define a soft architecture. While the Daybed draws from mast construction, the room conceived around it references sail design. Four inner walls made from suspended billowing non-woven textile, occupy much of the room’s volume and create an intimate area around the daybed. The nested space is oriented at a 45 degree angle to the enclosing corrugated steel walls, and has four entry points at its corners. The floor is covered with a thick sound dampening felt, and the ceiling is open to the sky above. 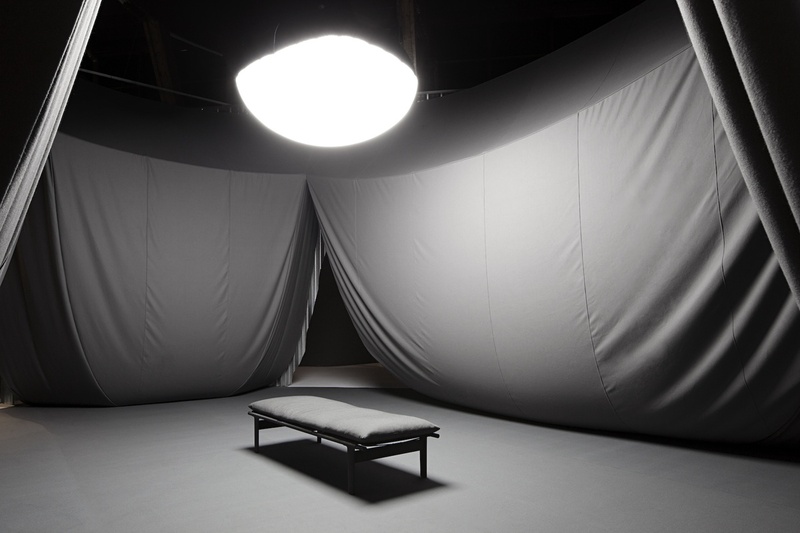 The overhead aperture hosts a single light source, a lighting balloon used on film and television sets, that casts a soft light on the curved walls and day bed below. The space is intended for contemplation and rest, and explores the wide structural, spatial and visual limits of textile.